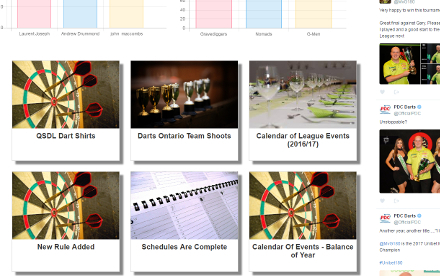 Need a website for your dart league? Well you've come to the right place. YourLeagueStats.com has been providing leagues with quality websites, the easiest set-up and the best customer service for over 10 years. First and foremost we are darts players. We have been involved in leagues for as long as we can remember and we know what you need to run a league. 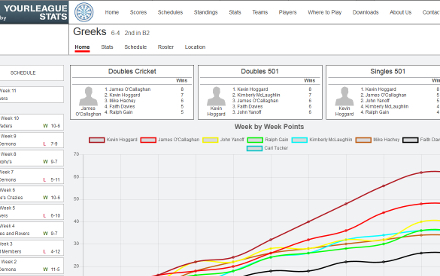 We'll provide you with the tools to have the best league site with the best stats you can imagine. 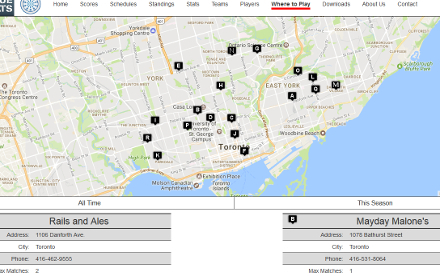 Lots of free time to grow your league! All that time spent building schedules, entering results, calculating stats, updating your site is now going to happen in a matter of minutes. 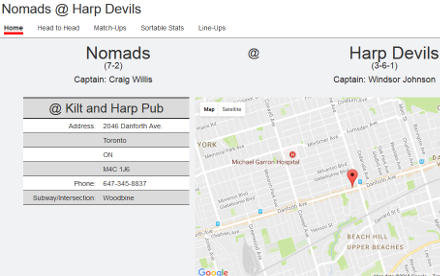 We provide a schedule wizard, captain entry, stats updates at the touch of a button, customizable news feed, player of the week, a playoff module, awards presentation, sortable standings and stats, result verification, your own Twitter feed, your own Facebook page feed, exportable schedules/stats/standings and much more. Here are some screen shots to whet your appetite. With our automated sign-up you can be up and running in minutes. You can run your website for free or for just $1 USD per player, per year you can get all the advanced features. Click on an image below to see in more detail. Need to ask a question then fire away. Email us at support at yourleaguestats dot com or use the form below. 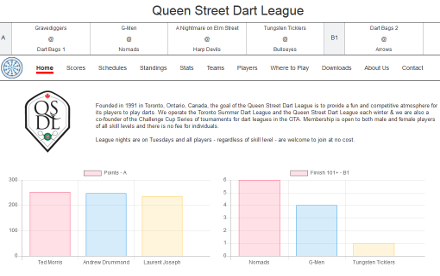 Want to see some leagues who are using us before you ask a question then go here (We recommend selecting Queen Street Dart League as they have been on YLS for 10 years so there is a lot of historic data). "Have set up 3 leagues to run on this program and have used it for over ten years. Almost everyone loves the ability to see their stats compared to all others in the league. Can even be sorted to show only males or only female players stats or just your division. Many kudos to the people who created and maintain the program and hold the cost down to a manageable cost to the leagues. Not to mention the ability the leagues have to charge sponsors to advertise on the site thus giving the leagues a way to transfer the cost of running the league to the sponsors. Nice touch guys. Really love the program. Initial set up is a little tedious but once done the ability to set up the next season is a breeze. 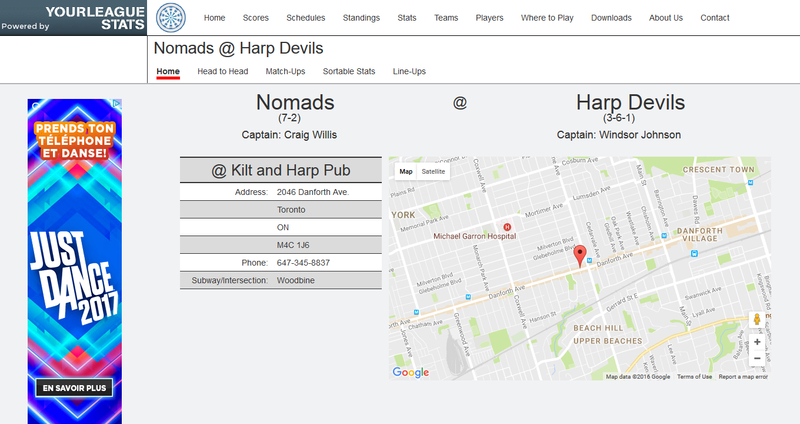 Score sheets can be setup to match league score sheets. That is another plus. You have to really get into this program to understand all of the options. I have found many by trying different setting. My only recommendation is set up a dummy league first changing the different options to see if they fit you. Change the errors you made and do it again. After doing this it will make it much easier to set up your first league." "Just finished transitioning to YLS. We anticipated having to change the way we did things to conform to YLS, but to the contrary, YLS proved so flexible we were able to duplicate our league setup exactly. Obviously, YLS was written by folks who play the game and understand the multitude of variations that exist across different leagues. It is a pleasure to use YLS." 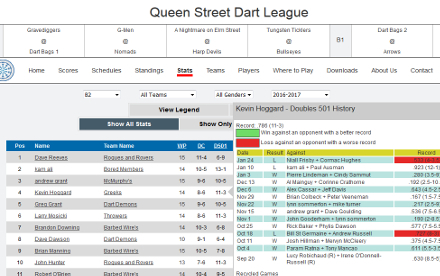 "We--the Olde English Dart League of Philly--are in our fourth season of using your site to track our stats, schedules, etc. It's been fantastic. So many members enjoy the competitive points and seeing the line-ups. I personally love that we now have a robust archive for past seasons. And, as one of the members that enters stats, I can also say it's been a super easy system to use. Thanks!!" "Thought the software was excellent and easy to navigate"
“...much better than faxing in the sheets. First, it eliminates the tedious task of having some poor soul wade through a pile of illegible faxes each week. Secondly, if one Captain is tardy, the other can step in"
"Having now run through the scheduler, I can say it was bloody brilliant. Yes, it didn’t automatically schedule for no clashed. But it did make it very easy for me to see where the clashes were, and tidy them up. Bloody brilliant. 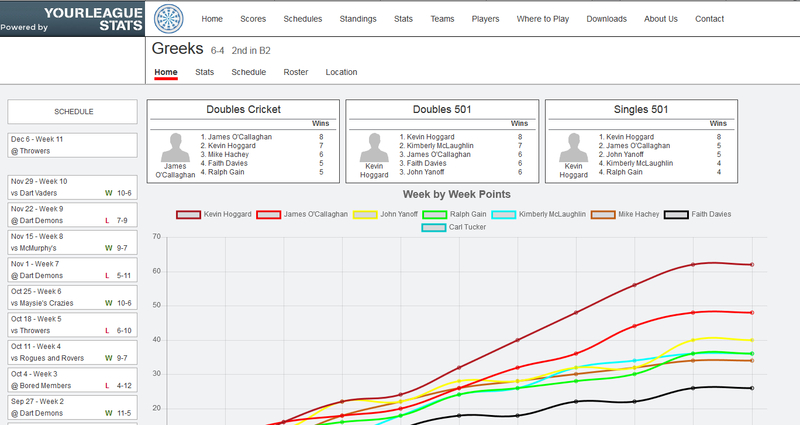 Lots of members of our league are quite excited by the new way of working, and are really looking forward to it. Thanks once again, especially for your responsiveness and help." "Thank you so much! We will continue with you as long as we are a league and you are willing to have us! I love your site! Thanks so much for everything!!!"